As we are a 'Serious About Security' Locksmith company we have developed our own restricted profile key that can't be got anywhere else in the World, can't be cut anywhere else in the World and can't be copied anywhere else in the World as the profile of the key belongs to us. 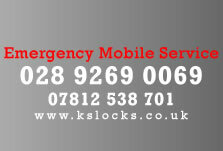 It can only be got from us therefore maximising the security of the possible duplication of your keys. This is known as a restricted key system. 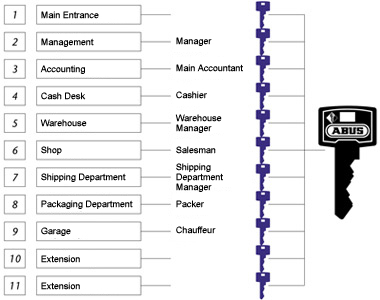 The central keyed system is a system where several different individual keys operate one or several central cylinders. 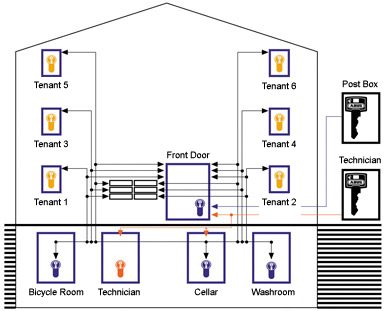 Example: Each tenant of an apartment building can also open the front door, the cellar door, etc. with his apartment door key. 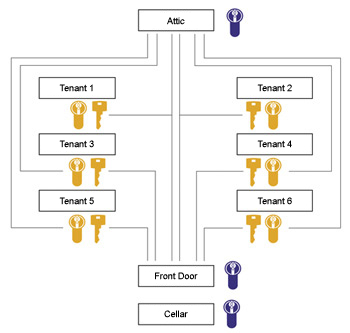 The central keyed system with a technical master key is a system where an additional key - the technical master key - operates several different central cylinders. 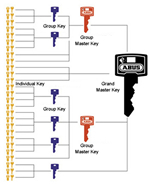 The master keyed system is a system where the master key operates all different cylinders of the system. Example: The manager of a company can operate all rooms of his company with the master key. 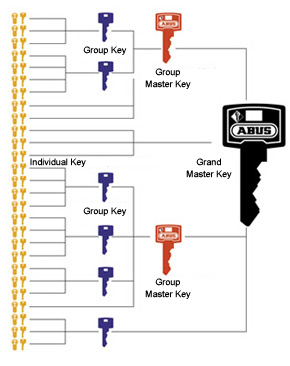 The grand master keyed system is a system where two or more master keyed systems are combined. In this case the master key is called a group key and the key that can operate all cylinders of the system is called a grand master key. Example: Various areas of the system are divided into groups (e.g. administration, technical department, etc.). The respective manager of the department can only operate the cylinders of his group. The owner of the grand master key has access to all rooms of the system. Because Pfaffenhain specialised many years back in sophisticated lock and security system manufacture, it has now an excellent reputation all around the world. Reference projects like the 7 star hotel 'Burj Al Arab' in Dubai are genuine proof of that. Behind these successes, the Saxony based company is the only manufacturer world-wide to produce door cylinder cores with a diameter of 14mm. Usual cores for door cylinders have a 13mm diameter. By optimising the construction of the cylinders, the diameter of the core had been successfully enlarged to 14mm. The most important advantage: Using this supplementary 1mm, the company is able to produce locking systems providing the highest level of precision and technology. The core diameter of 14mm makes it possible to employ pins which are 1mm longer than those used with comparable products. The changed geometry leads to a better guidance of the pins in the tumblers and avoids the wear and tear effect. The special characteristic of construction, the variety of articles and the flexible manufacturing of different cylinders are the reasons for the excellent reputation of Pfaffenhain. The company's own electroplating workshop and the sophisticated key manufacturing centres ensure a very fast run of production. The variety of locks offered satisfies all needs: from high quality single cylinders to locking systems containing 10,000 cylinders. In addition, Pfaffenhain has very flexible production. Thanks to state of the art equipment, the highly skilled workers and engineers are in a position to fulfil any individual requirements - proven by their many national and international security contracts.